Another method available to score the data without refitting the model is to invoke the PLM procedure. In the following statements, the stored model is named in the SOURCE= option. The PREDICTED= option computes the linear predictors, and the ILINK option transforms the linear predictors to the probability scale. The SCORE statement scores the Crops data set, and the predicted probabilities are saved in the data set ScorePLM. See Chapter 75: The PLM Procedure, for more information. The "Fit Statistics for SCORE Data" table displayed in Output 60.16.1 shows that 47.22% of the observations are misclassified. The following statements use the previously fitted and saved model in the sasuser.CropModel data set to score the observations in a new data set, Test. The results of scoring the test data are saved in the ScoredTest data set and displayed in Output 60.16.3. The EFFECTPLOT statement that is specified in the first PROC LOGISTIC invocation produces a plot of the model-predicted probabilities versus X3 while holding the other three covariates at their means (Output 60.16.4). 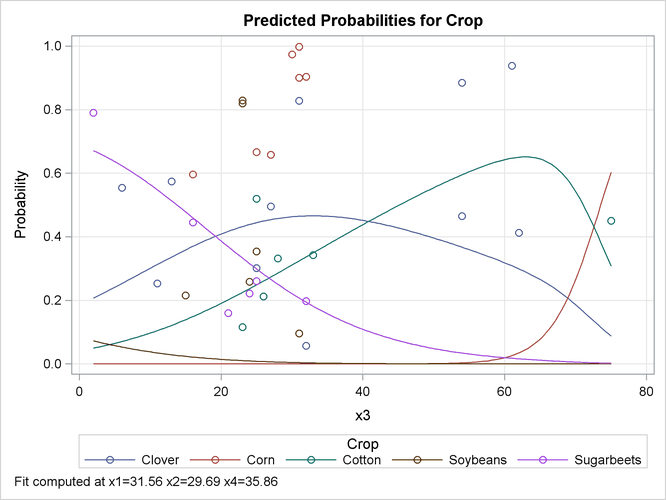 This plot shows how the value of X3 affects the probabilities of the various crops when the other prognostic factors are fixed at their means. If you are interested in the effect of X3 when the other covariates are fixed at a certain level—say, 10—specify the following EFFECTPLOT statement.